Guillermo del Toro, director of films like Hellboy and Pan’s Labyrinth, has recently directed his creative talent toward writing The Strain Trilogy, which is his frightening take on vampires. Co-written with Chuck Hogan, the trilogy consists of The Strain (released in 2009) and The Fall, which was just released last week. The books’ publisher recently posted a video of del Toro talking about the trilogy as well as classic vampire lore. Check it out below. New York is in chaos. Fires burn uncontested on deserted streets and avenues. Looters have their way with abandoned shops. Desperately overextended and underinformed emergency response teams are all that remain of the city’s shattered infrastructure. Masses of panicked citizens clog the highways and train stations, frantic for any means of escape. And what they don’t know is that they are fleeing a fate much worse than death. 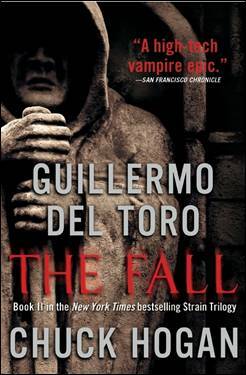 The scene is thus set for THE FALL (on sale now), Guillermo del Toro and Chuck Hogan’s knuckle-bleaching second volume in The Strain Trilogy. The prior entry in the series, THE STRAIN, was an instant global bestseller lauded by Nelson DeMille as “Bram Stoker meets Stephen King meets Michael Crichton”. At its conclusion, the omnipotent vampire Master unleashed a plague of bloodlust on the world, crippling major cities and leaving little hope for humanity. It falls to a small but resolute band of survivors to prevent the Master’s plan from succeeding.